Late post today, but it's worth it! I'm finally getting some traction on Halloween costume sewing-- Ishaan and Amaani are going to be Batman and Batgirl. (Robin was vetoed by my husband, and I thought Cat Woman was a bit too grown up). I found cute Halloween 'jammies for Ishaan that would work, but no such luck for Amaani. I ended up cutting out a felt Batgirl symbol. Gluing the applique on would work for Halloween, but then would ruin the shirt for later use. And being the frugal seamstress that I am, I'd like to use shirt after Halloween. I ended up using the Magic Stitch tutorial to put the Batgirl sign on the shirt, and I'll also use the same stitch to tack their superhero capes to their shirts. On Thursday I'll use a seam ripper and pull the batgirl out-- and be able to use the shirt for the rest of the winter. I did the same thing last year, and my son still wears the jacket and pants from his costume. It makes for a very frugal (and comfortable) costume! The two costumes together cost under 10 dollars. The shirt and pants will be used again, so I didn't count them. Cutting out the applique and stitching it down took me about 20 minutes. Plus, I didn't burn my fingers! 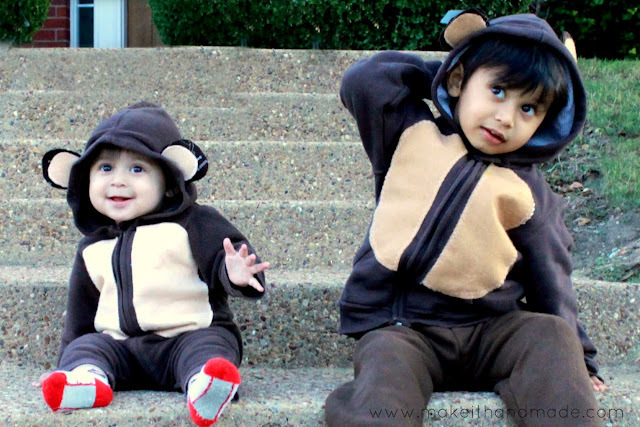 Even if you don't sew or even own a machine, you can put the glue gun down, and make the money you spend on your child's costume stretch through the whole season. I used the magic stitch to temporarily adhere the Bat girl symbol on. I wouldn't trust it to go through the washing machine, but it's perfect for one night! 1. Use BIG stitches. My stitches in the photo are between half an inch and an inch apart. The bat still feels plenty secure in case Batgirl runs into any hooligans on the way home. 2. Use a single strand of thread to keep the the knit t-shirt as intact as possible. 3. (optional) Consider using a ballpoint needle. I did these with a regular needle, but I'll be picking up ball point needles the next time I'm at the store. I hope that helps! Any other costume procrastinators out there?